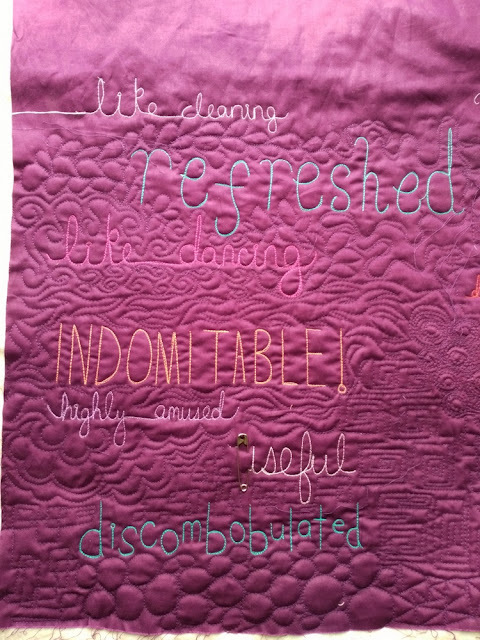 The Today I Feel Quilt is my ongoing large wholecloth quilt project. 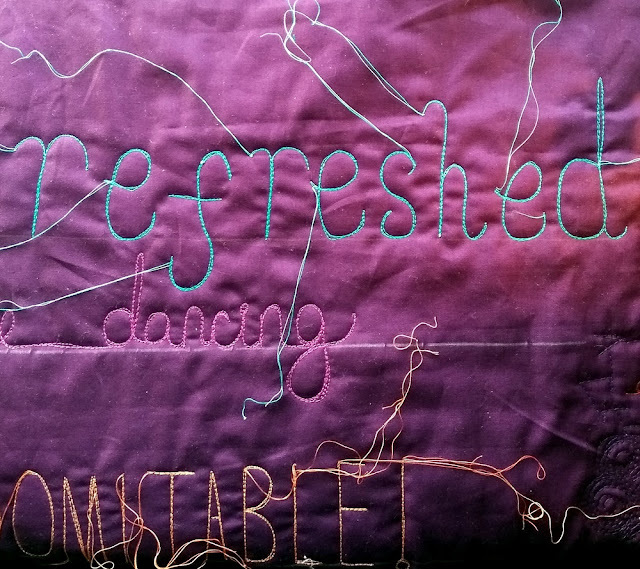 I'm writing one post every week about the past week's phrases, which answer the prompt, "Today, I feel...." You can read more about the project on Week 1's post and my daily expansions on each phrase on Instagram under the hashtag #todayifeelquilt. The threads are generously sponsored by Aurifil Threads. Week 2 of the #todayifeelquilt was decidedly more positive. It was a pretty typical week in my life - gym, school, tutoring, and a little sewing (this project, with just a few minutes a day, was what I made the most progress on). I expect that this coming week, with Thanksgiving and lots of family time, will provide even more interesting words. 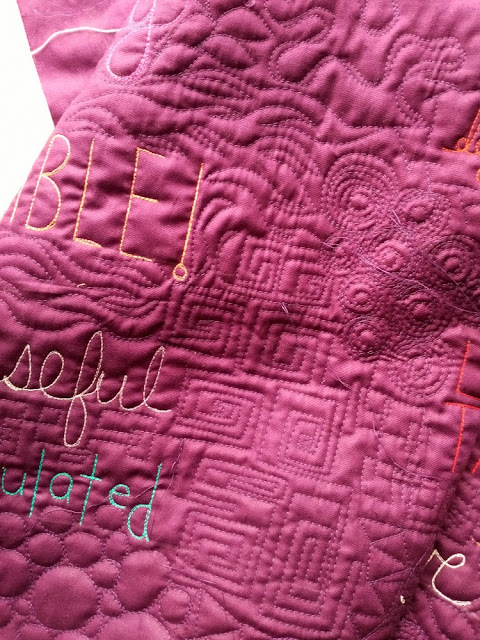 I've been quilting around all the week's phrases on Sunday, There are lots of details embedded in the quilting to match the phrases. I promised to talk about the process of writing words on this quilt, so... here goes. Almost everything I do is an experiment. Fortunately, I've quilted words on smaller pieces before, but nothing quite prepared me for writing on a much larger quilt (40" wide). See, when you're quilting on a domestic machine using free motion quilting, you can often turn the quilt in any direction to work on a motif (to alleviate bulk). When you're writing words, though... they kind of have to be in one direction. Ideally, they'll be straight, too, which is why I use a ruler and a handy dandy Fons & Porter chalk pencil to draw a line (plus, I love that these chalk pencils have erasers!). I'd usually use my hera marker but that's the downside of quilting on purple fabric; it's much harder to see the indent. So, chalk it is. Some friends on Instagram have asked me how I write the words. Do I trace them? Nope, I just draw the line (there have been a couple of words that I drew both a top and bottom line for, but I usually just eyeball it. No one will notice if they're a little off). 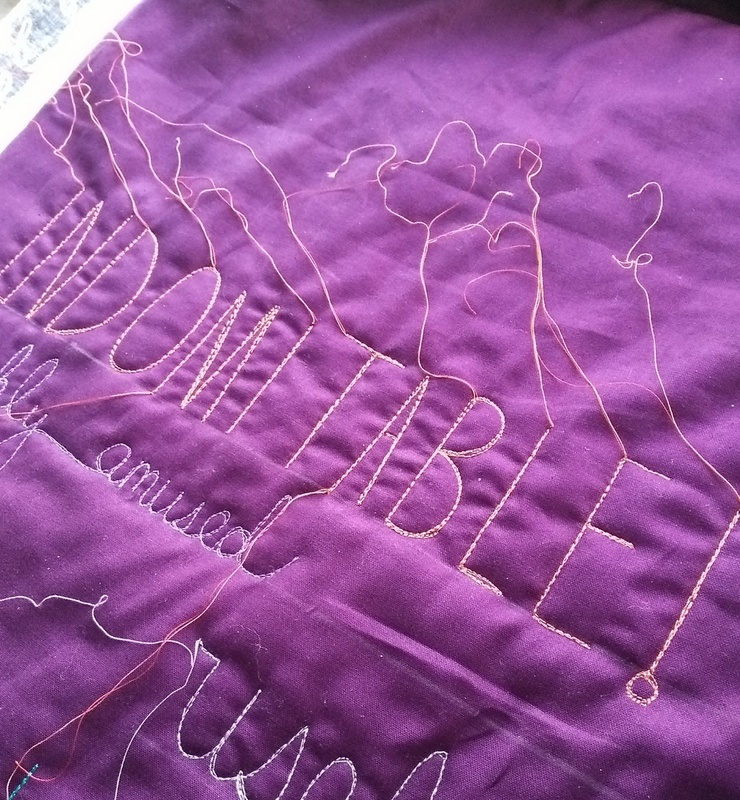 When I have the word in mind, I take a step back to decide approximately how large the letters will be (in fact, part of my vision for the quilt is to have the letters vary dramatically, so it's all very day-to-day). Then, I quilt the word(s) and often trace over them two or three times for definition. Cursive is the easiest, quickest way to write a word; you're only starting once. But some words beg to be represented in a different font, so I make a little more time for those. Lots of starts and stops, means lots of threads. My sister, who is not a quilter but an avid quilt cheerleader, mentioned her love for the photos where the threads still hang. I've been lazy throughout the week and tend to bury them at the end, when I'm about to quilt the details around the words. Sometimes, though, I feel like leaving the threads would be a good idea - it feels raw and "real." Buried and cut threads feel like cleaning up. But, this quilt will hang in a show, and I want it to be long-lasting, so I bury those threads. 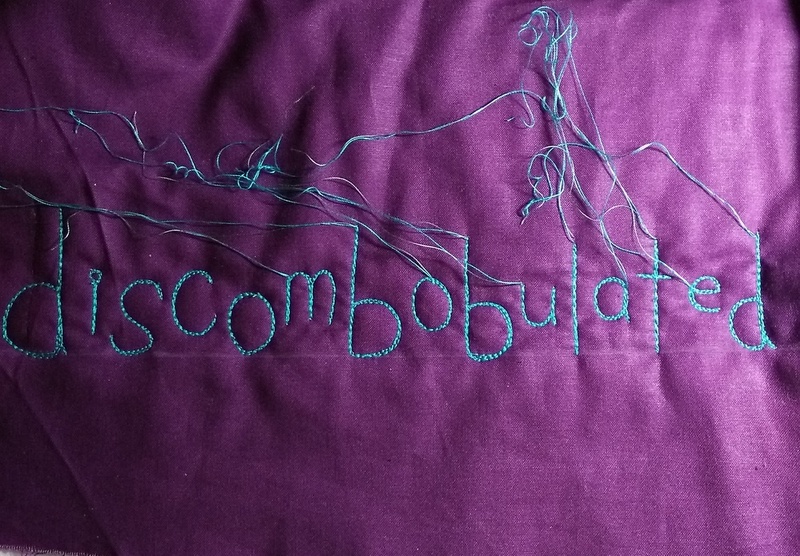 Anyway, except for one small misspelling and an unsightly bump on the backing, I haven't unstitched any words yet. I'm pretty well-practiced in lettering and cursive, but I honestly believe anyone can do this if they have good free motion control on their domestic (or longarm) machine. People ask me how I got good at free motion quilting... well, how you get good at anything. You practice! I have free motion quilted almost every day (I'd say at least 4-5 times a week?) for the past 4 years. You can do anything when you are confident! I was going to talk about using thread to create contrast, too, but I'll save that for next week when more of the quilt will be covered. If you have any questions, I'd be happy to answer them! Just let me know in the comments. Thanks for your support of this project. I can't wait to see what happens next. I agree that once you've committed to practicing free motion quilting that words really just need a line or reference to create. We've all had more practice writing than doodling and letters seem to come very naturally. It's fun to see all the threads that need buried, and I am loving the texture you are adding through the background quilting. Have a great week, friend! Jess, this quilt has really taken off! I'm really loving the reveals of your words--current favorites are discombobulated and indomitable :) As a retired teacher who still taught cursive handwriting to her students, I hereby give you a grade of: "A+ Beautiful handwriting while showing your own personal style". Looking forward to more! This is going to be a great quilt!! My "handwriting" is much better with my longarm then with a pen - I'm slower with the longarm, so I'm sure that's the reason!! I wrote the Pledge of Allegiance on a QoV...because it took up so many lines, I did write out the words in cursive before starting the quilting. I love the look of the quilts where all the quilting is writing - so much fun to read as well as fabulous texture!!! It's interested to see/read your methods. I usually write the words on my quilt and if it's easier I will actually quilt them backwards and/or upside down! Maybe that just adds an extra level of difficulty, but if I can reduce bulk in the throat it's usually worth it. Your words look great, I love the variation in color, size and font! Exciting News: Special Exhibition and Workshops!